The "Fire Safety Certification Mark" issued under this system is displayed at a hotel which has been checked by the fire department that it complies with the Fire Services Law and other important building standards. The “Fire Safety Certification Marks” are issued to hotels which meet the fire safety standards. Since hotels are visited and used by various people, they are required to follow the fire safety standards and take measures for fire safety. Specifically, they are required to prepare plans for initial firefighting and evacuation, to carry out training, and to install fire protection systems according to the Fire Services Laws, and also to meet the important standards for buildings, such as structures, compartmentations, and staircases, according to the Building Standards Law. The "Fire Safety Certification Mark" is issued to a hotel which has been checked by the fire department that it complies with the Fire Services Law and other important building standards. Buildings subject to the Fire Safety Certification Mark. The "Fire Safety Certification Mark System" is applied to hotels which have a capacity of 30 persons or more and 3 stories or more, excluding the basement floor. There may be cases in which the fire department may define the scope of the System’s applicability differently in accordance with the local circumstances. Two types of "Fire Safety Certification Mark." 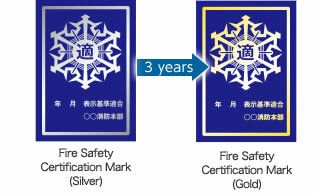 The "Fire Safety Certification Mark (Silver)" is issued when it has been checked by the fire department that it complies with the fire safety standards. The "Fire Safety Certification Mark (Gold)" is issued when compliance with the fire safety standards has been acknowledged for three consecutive years. Fire safety standards to be met in order to obtain the "Fire Safety Certification Mark." For having a "Fire Safety Certification Mark" issued, it is necessary to prepare plans for initial firefighting and evacuation, to carry out training, and to install fire protection systems according to the Fire Services Laws, and also to meet the important standards for buildings, such as structures, compartmentations, and staircases, according to the Building Standards Law. In addition, preparedness for disasters, such as earthquakes, and appropriate handling of hazardous materials, such as kerosene, are required. Q. Where to find the "Fire Safety Certification Mark" displayed? A. The "Fire Safety Certification Mark" can be easily found at the reception or entrance of the hotel. Q. How to make sure before staying? A. The hotel’s website will help you find whether they have the "Fire Safety Certification Mark." Some fire department and city website offer a list of local hotels which have the "Fire Safety Certification Mark." Q. What about hotels without the "Fire Safety Certification Mark"? A. A hotel without the "Fire Safety Certification Mark" does not necessarily mean that it does not comply with the fire safety standards. This is because the "Fire Safety Certification Mark System" is based on voluntary application. A hotel in which the "Fire Safety Certification Mark" is displayed has surely been checked by the fire department that it complies with the fire safety standards. Therefore, guests can be sure of selecting a safe hotel by checking whether the hotel has a "Fire Safety Certification Mark."